I'm still in Beatles kindergarten learning my ABCs. I am really surprised I even got George. Yes, it's 22 June 1957, but calling it, as the article does, "The Earliest Photograph of John Lennon and Paul McCartney Together" is slightly misleading. They can hardly be said to be "together" if it is Paul. 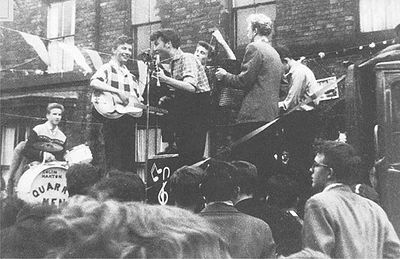 All it adds is the possibility that 6 July was not the first time Paul saw The Quarrymen. An interesting photo, and one I have wondered about, but I don't think it contradicts the history about when John and Paul first met, and the first photo of them together, and not just in the same picture, comes from after they met. First impression - that's Paul McCartney ! Not for me is that Paul in the picture. I'm still not sure whether Paul needed glasses or not, but this examines that picture. ^^ That's how this conversation got started. Has anyone ever asked Paul if he recognises himself in that photo? If not, is there way that this website could do it? I'm not sure about the first question. I think he has though. Regarding the second question, I bet that is one of @Joe's wishes when he blows out the candles on his birthday cake each year, sees a shooting star, sees the first star of the night, and throws a penny in a wishing well. I'm a newcomer here so I don't want to get ahead of myself, but Joe has surely earned the right to at least ask for an interview with Paul. As they say on Top Gear, what's the worst that could happen? If the question isn't asked, it won't happen. If it is, it just might. I'll let @Joe take that one on. I sure think he has earned an interview. Who knows, perhaps one day. Aw, dang, that would be exciting! This is a bit off-topic, but never mind. I've never asked. From what I can tell, he tends to give interviews to press when he's got a product to plug, but less often to authors wanting to conduct a more wide-ranging interrogation. And to be honest, apart from a few arcane details, there's not a lot I really want to know about him. He must have given thousands of interviews over the years, with ever-decreasing returns. The more recent ones I've read haven't been hugely illuminating. He declined to be interviewed by Mark Lewisohn for All These Years, but spoke in depth to Tom Doyle about the post-Beatles years. That suggests he's fairly selective about who he talks to, and the subjects under discussion. It's funny, I often think it must be amazing to sit down with a Beatle, but if it happened I bet I'd clam up and/or go into rabid fan mode. Also, I'm sure if he was asked about the Rosebery Street pic he wouldn't know if it was him, but would give a fairly generic response nonetheless. I don't generally enjoy doing interviews - I've done plenty in the past, and often find them to be more trouble than they're worth (researching, setting up recording kit, writing some decent questions, coaxing good answers). I definitely don't enjoy the press day thing when you get an allotted 10 minutes with someone. But the real truth of the matter is I get a bit anxious in social situations so prefer to hide behind a computer rather than meet people or speak on the phone. parlance, Ahhh Girl, meanmistermustard, C.R.A. Hehehehe, I guess that was me projecting MY fantasy onto Joe. I'd get McCartney alone any which-a-way I could. I'll gladly spend a thousand wishes on that scenario. To be honest, spending time with him informally over a meal or a drink would be the most agreeable situation, maybe for him too. A formal interview could be stilted and difficult, but he might be more inclined to agree to this than in the past. I think he's more open about meeting the public than before. It could be that reminiscing on the record about the Beatle era is awkward because of legal difficulties. Anything he says could be challenged by the estates of John Lennon and George Harrison , and he doesn't need that, but if he was given the opportunity to approve of the published draft before it goes to print, he might be prepared to consider the idea. People on here aren't trying to trip him up - we are just curious about the remarkable personalities behind the most iconic band of all time. I think a request should be made, and of course I'm more than happy to volunteer my services if you need some moral support! On top of the legal aspects you alluded to, he's probably fed up (just based on a few tracks he's written recently) with being told his 'reminiscing' is inaccurate. I think we've all found ourselves with a memory or two that may not be accurate, but it's how we remember it. Having someone get in your face with reams of quotes and tape evidence to suggest your memories are faulty, is probably exasperating. I can't fault the man for wanting to back off recollecting his past to a media representative. Not to mention the whole 'life after Beatles' thing. he's probably fed up with being told his 'reminiscing' is inaccurate. I think we've all found ourselves with a memory or two that may not be accurate, but it's how we remember it. Myself personally would much rather adopt the record on how The Beatles & their Close Associates "remember it", and not what some historian claims to may or may not have happened. Even the "inaccuracies" give much insight into the truth, depending on who and how it was represented, and even more importantly, when it was said. I make my "recollections" (if they can even be called that) primarily from first hand sources predating John Lennon 's death, and for two reasons. First, many things have been said/claimed to have happened post-1980 that were never brought up while John was still alive and I believe that in a few instances that they wouldn't have been if he was. This suggests to me that John himself had closed the book on certain subjects for his own personal reasons which should be respected, or in some cases the claims are indeed false. Secondly, the numerous interviews provided by the four Beatles and their Associates given during The Beatles' heyday and throughout the 1970's were more "fresh" in their minds, having been given closer to the actual events and by minds/memories not deteriorated as much by elder age. No one likes to be told their memory is faulty or they aren't objective, but it's true nevertheless. Paul even disagrees with his own brother on childhood events, let alone anything connected to the Beatles. Nor can anyone say one way or another if stories are true/false just because they came out after John died, there's no objective proof. I think Lewisohn has done the best anyone really can to make sense of the memories and inconsistencies and has turned up some genuinely interesting information and questions. Eric Griffiths joined the merchant navy and was at sea 1958–64. The problem of piecing together the Quarry Men chronology, where so many anecdotes and memories are contradictory, is underlined again by the 2010 discovery of a document showing that Griffiths’ first voyage sailed on February 14, 1958. 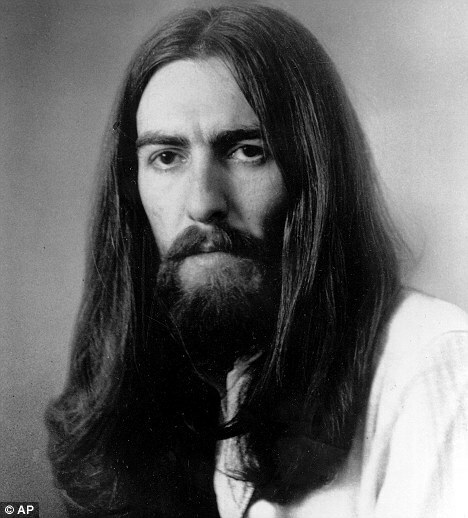 This means it cannot be him holding a guitar in the color photograph taken a month later … and yet George Harrison recalled instigating Eric’s dismissal, and Nigel Walley remembers Eric’s distress when he was informed of it. The only way these pieces could fit would be if George joined the group considerably earlier than February, but every account says he didn’t and his “audition piece,” “Raunchy,” was little known before this time—besides which, Eric would have been aware of his maiden voyage some weeks before it happened and wouldn’t have been upset at the prospect of leaving the group. 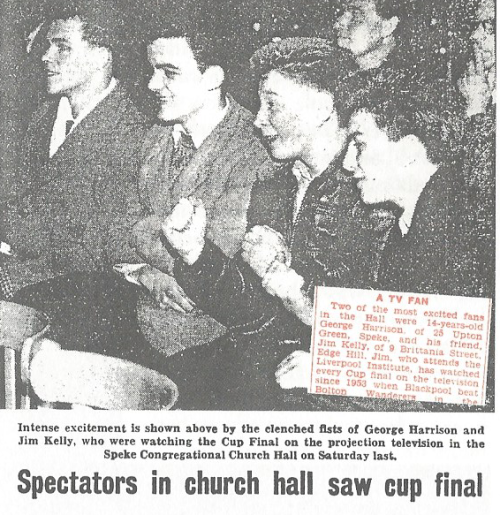 Perhaps the sailing record is incorrect and it is Eric Griffiths holding a guitar in the March 1958 photo; but if it isn’t, there’s no clue to who else it was. This is the Mike McCartney one that shows a guitar headstock to the left (over George's arm), and we don't know who it is. I've noticed a lack of Ringo. (Perhaps that might be the fact that in a lot of the earlier posts the pictures have been deleted or can't be seen anymore?) Anyway I have a few. Some I'm not entirely sure if they're late 50's or early 60's but I think they are pre-Beatles. I don't know dates or sources or anything- they've been picked up from random sites. I think a few are from his photograph book. I had others but I couldn't decide if they were late 50's or early 60's. Seriously I have at least one Ringo picture for any occasion. It says Jim Kelly, is that a mistake? Do they actually mean Arthur Kelly? Great pictures on this thread so far. However, because I'm a lunatic, I'm obsessed with chronological order. There must be a way to sequence these images to get a picture of the progression from childhood to adulthood of these guys. Thus, I'm doing just that. I'm finding all the young Beatle photos I can find on the internet and arranging them in what I believe is a chronological order. Nothing fancy, just google presentations. However, I'm terrible at dating things myself, so I'm hoping that some folk can help me. There are pictures that haven't been posted in this thread too, so you can go over to look at them if you want to simply browse. Feel free to edit and comment with whatever you like. Pretty much everything on them is speculative and I have an extra copy, so don't be afraid of messing things up. I'm looking to create a resource for people to look at if they want to find these photos, like the one on the main website but separated into the four by year. I split them up and I'm getting to them as I go, so have a look if you're interested.